Happy New Year! Here's to some personal development in 2016! I've always been a fan of personal development books, or what used to be called self-help books. I read my first self-help book at 15 when I picked it up from a bargain bin at Walden books (wow remember those days when there were small chain bookstores?). It was called "You Can't Afford the Luxury of Another Negative Thought" and it really changed my life on learning how not to go down the spiral of negativity that I felt all the time and to also learn to compartmentalize (to catch myself being unproductively negative and then re-route my thinking to a more positive outlook) . True, it didn't cure me of negative thoughts and of course it's something I always need to be aware of and work on (it's a practice), but it really helped me see the power of self-help books. Well I wouldn't recommend this particular book (it was actually meant for terminally ill or people with chronic disease with the idea that the negative thoughts contribute to disease- yeah it's a weird book for a 15-year old). I'm actually going to start with my favorite, which is on the far right, Daring Greatly by Brene Brown. To be honest, this is probably the book that has changed my life the most in the past few years. It gave me the courage to quit my steady job, to try blogging, to go out and try to make connections with new people, to give less f*cks, etc. It's exactly what I needed in this stage of my life. Here's one of my favorite excerpts from the book. 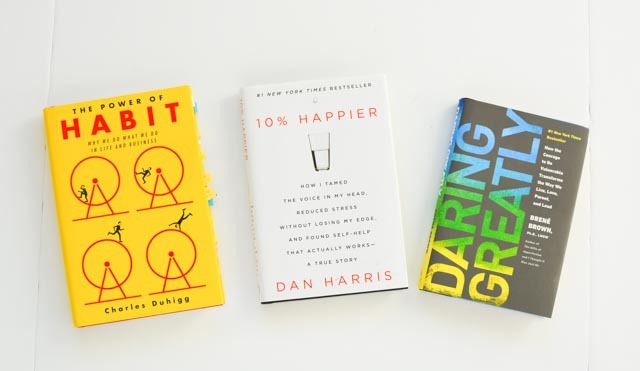 My second favorite of the three is 10% Happier by Dan Harris. If Daring Greatly sent me on the path to vulnerability, authenticity, and taking risks then 10% Happier was the sequel that helped seal the deal. Long story short, if you want to be 10% happier, you need to incorporate a mindful meditation practice into your daily life (and really learn what it means to let it be). And the third book isn't as life-changing as the top two but it's perfect for someone who is lazy and usually has zero willpower like me. The book is The Power of Habit by Charles Duhigg and it gives you a bunch of tips to try to learn good habits. In general, it's an interesting book and if it helps you get a couple more things done during the day (especially those hard things like working out and a daily meditation practice) then it's definitely worth a quick read.